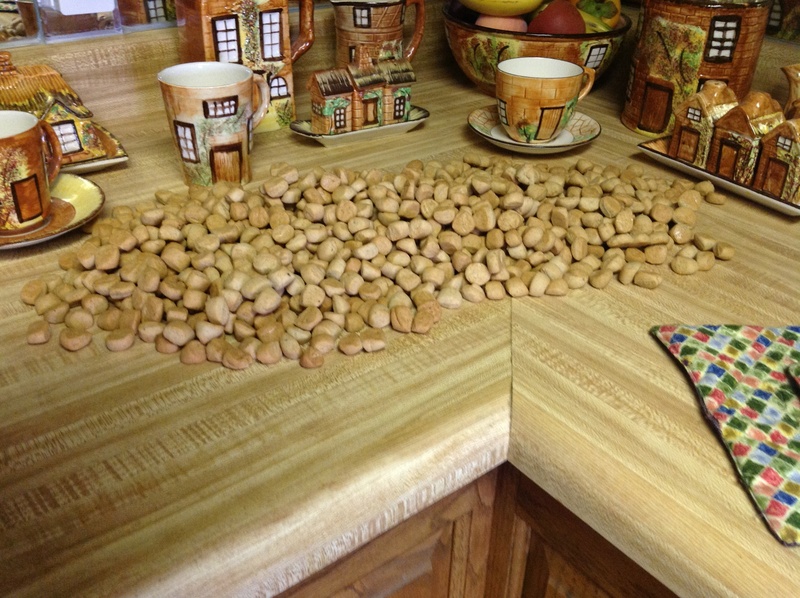 As we get closer to the end of planting season my tree world gets busier and busier. 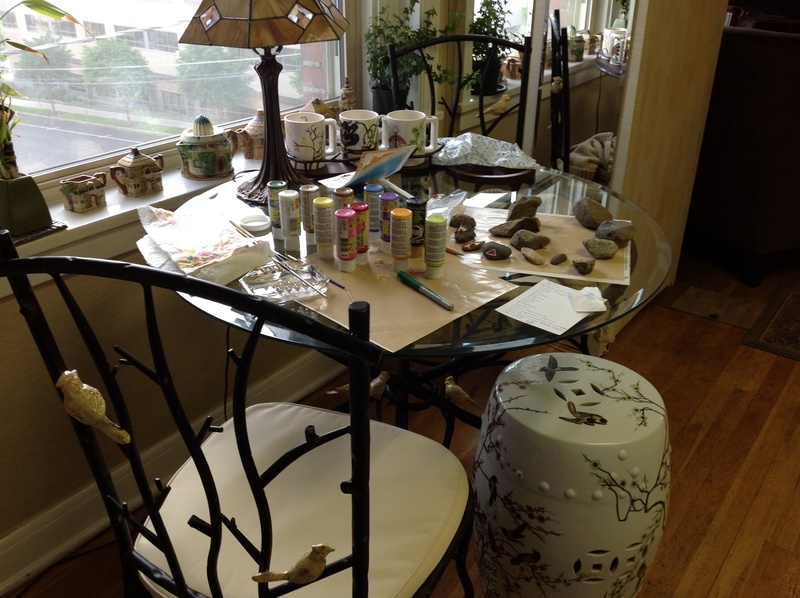 There is, of course, stone painting panic and cookie panic, but in between there have been lots of great happenings. 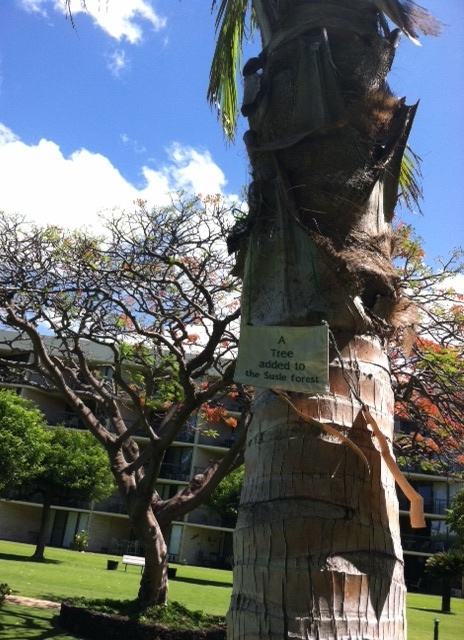 Susie palm tree in Hawaii sent by the winner of the 2011 Bicycle Alliance auction and the second of the little tree whips in Walla Walla. These are the first trees in these locations; the forest is spreading. 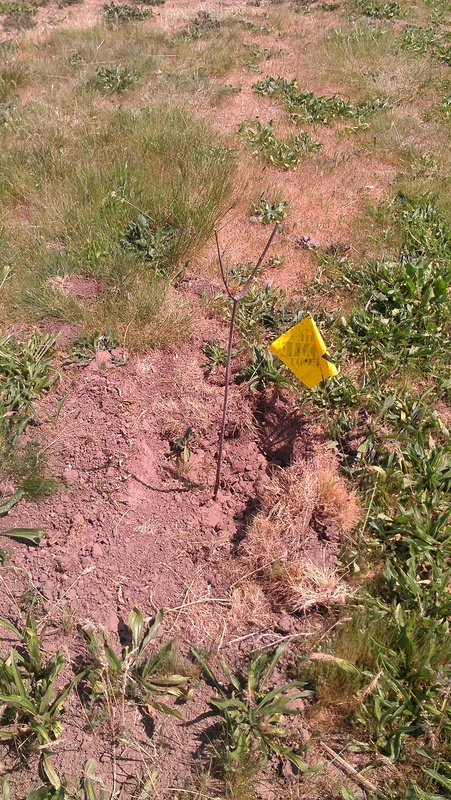 And there were three plantings in the last week. 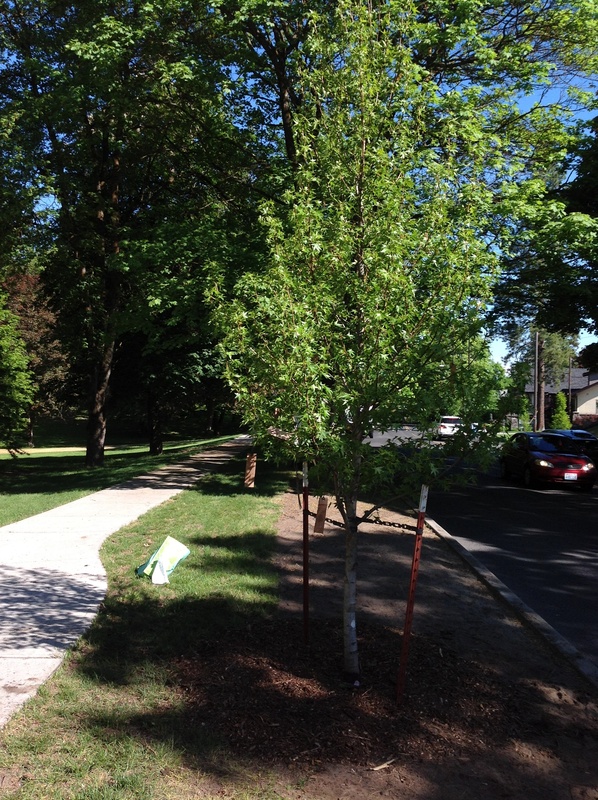 On Monday Becky’s poor white oak on Grand Boulevard was replaced by a sweet gum. The arborist told me it would be a wonderful autumn introduction to Manito Park for northbound drivers on the boulevard. He told me it would turn red and yellow and orange and purple. I’ll have to drive that route a lot next fall. Then we decided to put in the tree on 15th Ave. Yay, another street tree! and the residents of the house have already had compliments on their hedge maple . This tree will honor one of the housemates who has died. His friends will gather next week and we’ll do a dedication ceremony. On Tuesday I was a host for two members of the Friendship Force club from Cheyenne, Wyoming. 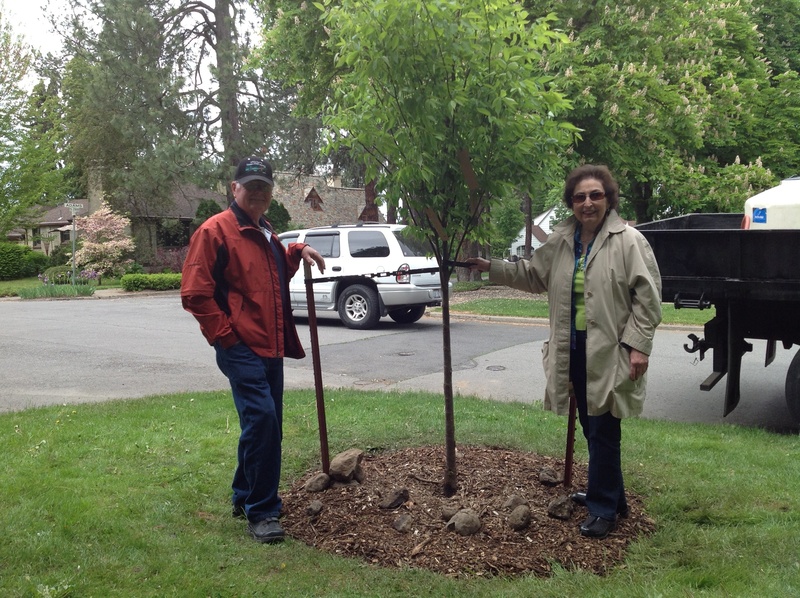 As part of the sights I was showing them we drove down 21st Ave. and stopped to plant a tree . 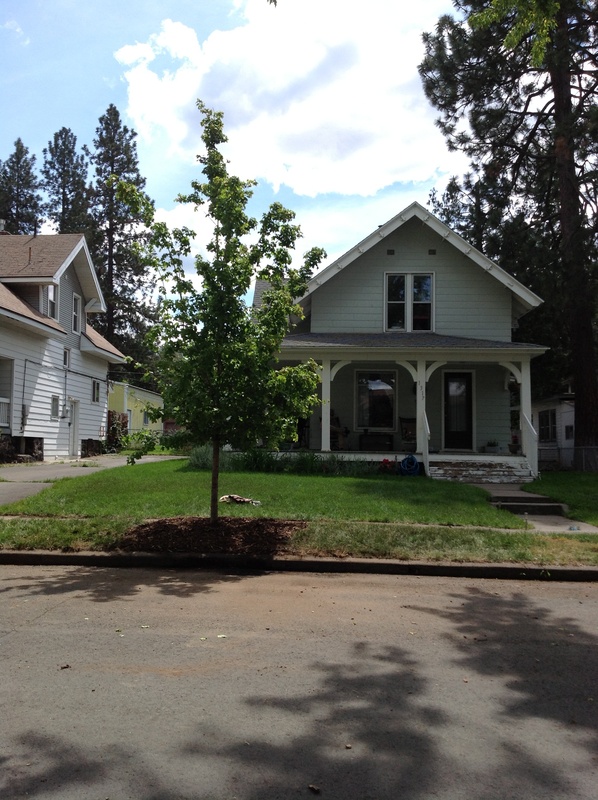 I love to plant trees here in Spokane for people from elsewhere because now they have roots here. Maybe they’ll come back to visit their tree sometime and I know that I’ll think of them every time I pass by this Zelkova. I’m ending up the week trying to reach the arborists because I have been busy making promises to plant trees before the end of the planting season and that’s next week. We’ll see if I make good on them.